Because of the potential length of the session and the anticipation that the number of attendees will exceed the City Commission Chambers’ capacity, a public hearing on the redevelopment of the Lido Beach Pavilion and Pool will be held on a Saturday, the Sarasota City Commission decided this week. Commissioner Shelli Freeland Eddie responded that she took offense at the comments, adding that city staff always conducts itself professionally. If members of the public become disruptive, she indicated, Mayor Liz Alpert can use the gavel to make them conform to the board’s code of civility. Deputy City Manager Marlon Brown explained during the earlier discussion that a combination of board member commitments and staff unavailability would make a November date impossible. Therefore, he said he would work to find a date in December or January 2019. Alpert pointed to her preference for January. December, she said, “[is] an extremely busy month. … I would opt to just move it to January.” She also noted that more seasonal residents would be able to attend the session after the first of the New Year. “I’ll bring back some dates,” Brown replied. Freeland Eddie, who proposed the Saturday hearing on the controversial project, also suggested that the session be conducted in the Grand Foyer at the Van Wezel Performing Arts Hall on the city’s bayfront. If that ultimately is not feasible, Vice Mayor Jen Ahearn-Koch proposed another city facility be used. Commissioner Willie Shaw noted the Municipal Auditorium — which he said has ample space — as an alternative. “Someplace large enough,” Alpert told Brown, summing up the board consensus. 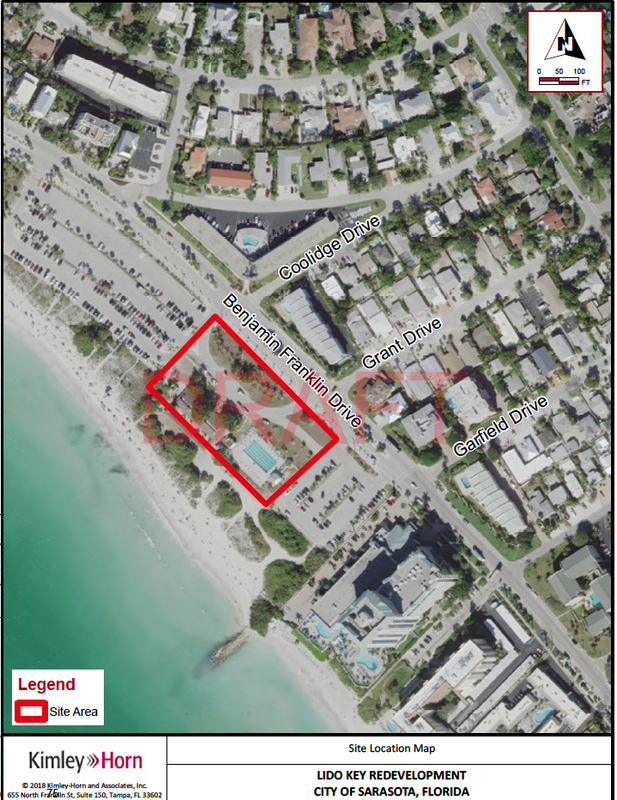 The hearing will focus solely on the request for approval of a Major Conditional Use and a Site Plan for the project as proposed by Lido Beach Redevelopment, a Sarasota company. 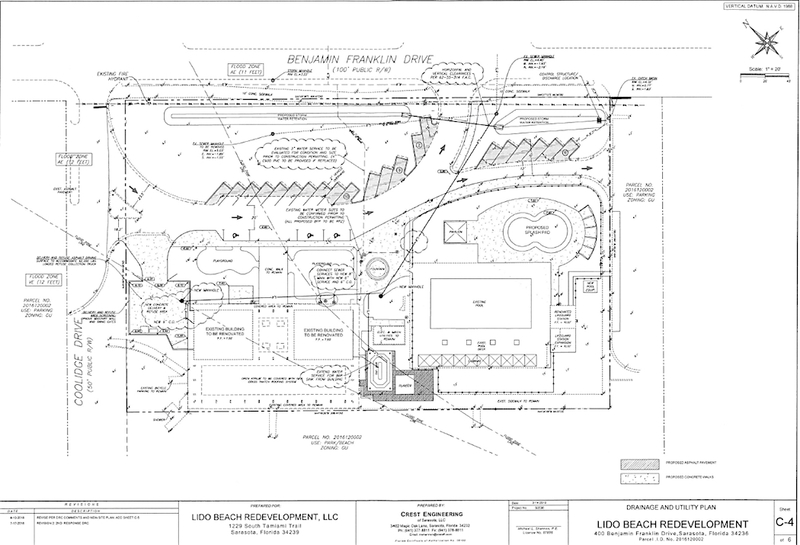 On Nov. 20, 2017, the City Commission voted 4-1 to lease the 2.42-acre Lido Pool and Pavilion property to the firm. Subsequently, Shaw sought to rescind that decision, leading to a failed vote of 2-3 during a special meeting on Nov. 30, 2017. Ahearn-Koch was the only board member on Nov. 20 to vote against awarding the lease to Lido Beach Redevelopment. Shaw joined her on Nov. 30. Before the two meetings last year, Troy Syprett and Gavin Meshad, two of the firm’s principals, already had tried to quell community concerns about intensity of their plans for the city facilities. Many of the more than three-dozen speakers on Nov. 20 complained about the potential for noise and traffic congestion and urged the commission not to give away public property. Syprett and Meshad explained that they estimated they would be spending $4 million to remodel Building A on the property into a 200-seat restaurant kitchen and service bar. At that time, they said they also planned to remodel the restrooms in Building B and add offices, a sundries store and an ice cream parlor; erect a fabric shade structure over the pavilion area; construct a tiki bar, a splash pad for children and cabanas along the west side of the pool deck; install decorative concrete for the pavilion and pool areas, as well as for the splash pad; and construct a playground and create open green space on the east side of Building A. Picnic tables would be installed adjacent to the playground for people who wish to bring their own food and beverages with them to the beach, they pointed out. They stressed that the public would be able to use vacant tables at the restaurant without having to purchase food or beverages. 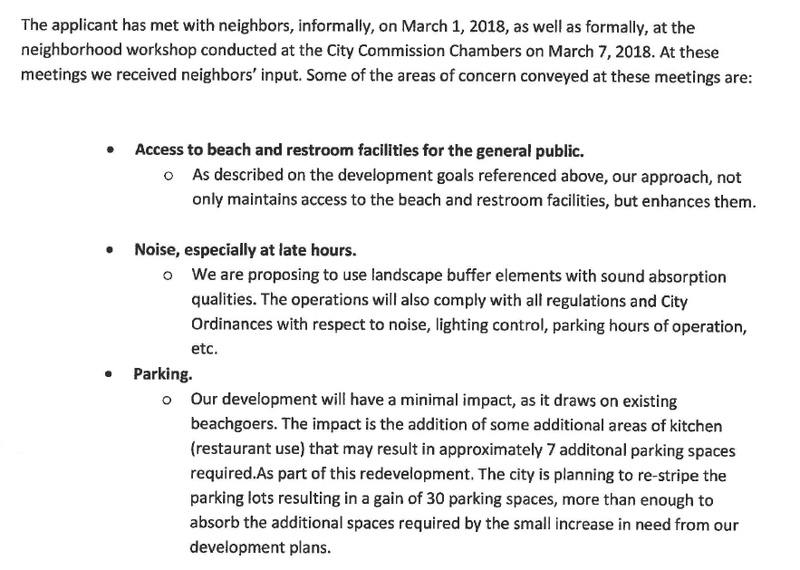 Furthermore, they emphasized that they would not in any way restrict public access through the facilities to and from the beach itself. The Sarasota News Leader counted 24 people who signed up to address the issues that night. Planning Board members concurred with public concerns about the intensity of the proposed plans and the potential for exacerbated traffic congestion. The Major Conditional use would allow the firm “to operate a restaurant with an outdoor dining area and an accessory ‘tiki’ bar,” the city staff report said. “The applicant proposes 233 seats in total, an increase of 69 seats. Ten rental cabanas within the pool area are also proposed. The existing restrooms would be renovated. 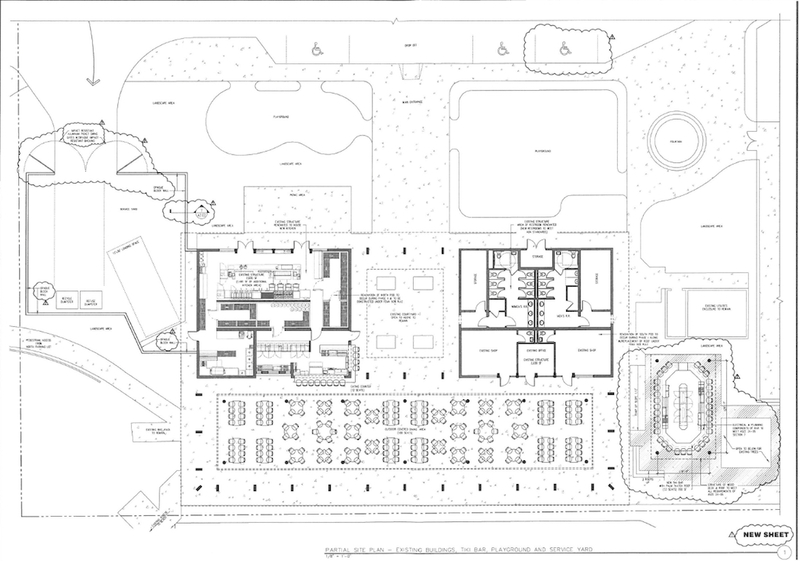 New shade structures, a lifeguard office, two playgrounds, a splash pad and 21 new parking spaces are also proposed,” the report added. “Staff found the proposed Site Plan and Major Conditional Use petitions to be in compliance with all applicable standards for review and therefore recommend approval of the petitions subject to the conditions outlined in this report,” the document noted. The takeout window would be open during all special and private events, so the general public could purchase food and beverages even if the restaurant and/or bar were unavailable. The cabanas in the pool area could not be used for general restaurant or bar seating unless another traffic study were performed to incorporate the cabana seating “as high-turnover restaurant seating” and the results confirmed that the additional seating would not cause the levels of service for nearby intersections to fall below acceptable capacity. The leasehold area would be a non-smoking facility. When Alpert opened the discussion near the end of the commission’s Oct. 1 meeting, she pointed to the length of the city’s Planning Board hearing on the petitions. After discussing the upcoming City Commission hearing with City Attorney Robert Fournier, she continued, she proposed splitting that hearing into two meetings. The first would encompass all the presentations, public comments and rebuttals. The second, Alpert said, would include commission questions, discussion and the vote. Her intent, she pointed out, was to ensure it would not be so late at night — “midnight or 1 or 2 a.m.” — when the City Commission hearing ended. “I have a different suggestion,” Commissioner Freeland Eddie responded. She recently had attended a conference during which local government leaders had talked of holding hearings on highly controversial issues on a Saturday, beginning early in the morning, Freeland Eddie said. “I am more in favor of that … This commission has the ability to give [this issue] its sole attention and, hopefully, we can get in and get out at a regular time. I would never suggest a Saturday meeting unless it was absolutely necessary,” she added, prompting chuckles from Commissioner Shaw. Deputy City Manager Brown then advised the board that he anticipated a January 2019 date would have to be set, given scheduling conflicts with the commissioners and staff, especially through November. “I’d rather do it on a weekday, to tell you the truth,” Commissioner Brody told his colleagues. “It’s too big of an issue,” Freeland Eddie responded, noting that the city board customarily does not conduct such hearings during its afternoon sessions but at night. Then Shaw made a motion to hold the hearing on a Saturday, Freeland Eddie seconded it, and Brody cast the “No” vote.